Whether your style is country or coastal, the Salcha indoor-outdoor side chair from Safavieh is a colorful solution to extra guest seating. 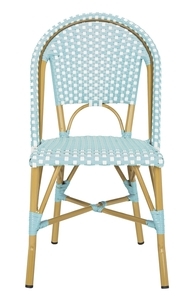 Inspired by classic European bistro chairs, the pretty and practical Salcha is crafted of teal and white wicker and aluminum faux bamboo for easy care. Dimensions (W*D*H): 18" x 21.6" x 34.6"
Seat Dimensions (W*D*H): 16.9" x 17.3" x 17.3"